Joey measured 44.5" and felt his best at just over 300lbs. Joey went through four homes his first three years. At his fourth home, he sustained permanent damage from a too-small halter that had been left on him and spent more time roaming the countryside than in his totally bare "pasture" that was mostly outlined by a fallen fence. We agreed to take him on as an emergency re-homing. He later proved marginal as a packer, and although we had various other clues that he may have been deprived of critical nutrients as a youngster, particularly selenium, his coat density and marginal shedding curaca type eventually led us to decide to castrate him. Joey proved even less capable as a packer after castration, so indeed he was not stud material, and his viable career options were now only "companion" and "light day-hiker." We truly wish we could have foreseen and prevented what happened next. In 2008, Peanut's breeders (who had earlier purchased her dam, Dallys) contacted us, asking if we would take in their three females (Peanut, Dallys, and Summer) because they'd decided to stop breeding llamas to concentrate on goats. They asked us if we possibly had a handleable gelding that would be a good companion for their remaining gelding. 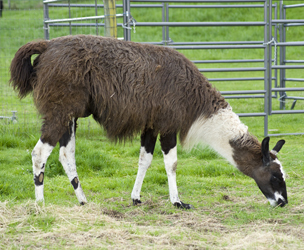 We thought that Joey, a sensitive and intelligent fellow, deserved a home with fewer animals, more individual handling, and with a proven ability to keep llamas' weight down (Joey had steadily been putting on too many pounds post-castration). And so we sent Joey up for retirement with the understanding that he was NOT a packer and also with the contingency that he would return here if he proved incompatible or if, for any other reason and at any other time, they no longer wanted him. You would think that people who'd called us first to find a good home for three females, with one of the pair having served as an animal welfare officer in the past, and also actively volunteering for a llama rescue organization at the time would be a safe home, right? We sure did, and so did everyone who knew all the involved parties. A lot of people were shocked at what transpired only two years later. On March 29, 2010, we received a phone call — Joey had been spotted at a meat livestock auction yard (being billed as a pack llama). A mad scramble ensued, but the ending was fortunately far better than if he had not been seen by the right people and subsequently recognized — a proxy was located to purchase Joey for us. On April 3, 2010, Joey Medicine Eagle came home to live here for good. Joey knew at once where he was and remembered many of our llamas, but he spent his first day back making it clear that he wanted to live with Kilchis in particular, and that he wouldn't be happy until they were together again. That didn't last — Kilchis is young and vital, and Joey carries the weight of trauma. Joey soon became Sydney's pal, appreciating Syd's geriatric quietude, and they remained friends until Sydney's death in 2012. We will never know what actually transpired, and why a previously good home (at least to all outward appearance and by all prior actions) not only turned so terrible but also nearly resulted in Joey's untimely death (had he actually been bought by someone else "as a packer" and not died at their home or on the trail, you can bet he'd have been returned to the auction to be sold for dog food). We did, out of courtesy, contact the people we'd sent Joey to live with and received first an outright lie (that Joey and two older goats were placed with a newly retired couple who were thrilled with them) and then, when confronted with the facts (ie, Joey was purchased at the meat auction and is now here, not with any "newly retired couple"), the response was a great deal of finger-pointing, more lies ("Joey was jumping fences", which was completely impossible given his weak physical condition when he returned here), and a host of pitifully inadequate rationalizations for what boiled down to the fact that they took the easiest way out with the greatest monetary return with no consideration for Joey let alone the humans involved. The contradictions and multitude of excuses in the response we received made it clear that they knew they were doing the wrong thing all along. Joey lived out his final years here in safety. Although he never received the amount of attention and mental stimulation that he would receive if placed out as a companion, we came to realize that Joey had endured more "mental stimulation" through the traumas in his life than he ever wanted. We wish we could have erased them, the most recent events in particular, and that Joey could understand we were committed to ensuring that he would never lose the comforting and familiar companionship of his long-time llama friends and familiar surroundings. Although Joey's eyes finally lost that dull, lifeless look, aging caught up with Joey prematurely. Some of this may be due to woolly genes; surely some of it was cumulative stress. A combination of liver compromise, loss of muscle mass, and esophageal problems — any of which could have brought on the others — led to Joey's humane euthanasia in October 2013, at only 18.5 years of age. Joey came to us without his papers — just a partial oral history and his call name, "Joey." We set about tracking down his registration and trying to select what we felt would be a more suitable name for a special llama. Joey didn't like any of our choices — he considered them too high-falutin — and wanted to know what was wrong with "Joey," which he liked. When we finally got Joey's papers and saw his original registered name —"Ixidro D'Concoliano" — we understood completely. "Joey" would be just fine!